50 sq ft studios: Thread, glorious thread! So blendy and luscious! Thread, glorious thread! So blendy and luscious! A few months ago, I was asked if I would be interested in playing with an upcoming special collection of Aurifil thread. With my super fan status of Aurifil already being well documented, and the side of my personality that makes me want to collect them all, of course I jumped at the chance. Even if you don't piece many quilts, this versatile thread is great for small bags and accessories! 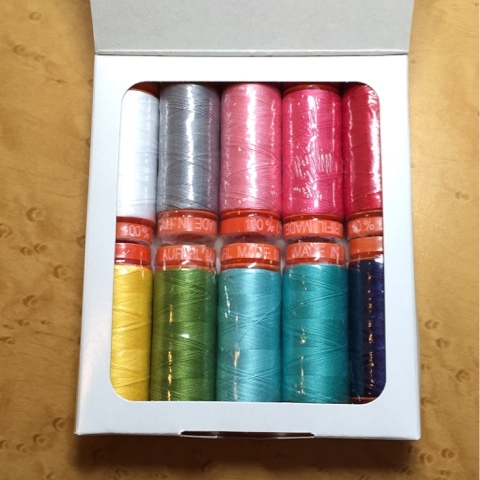 The amazing team at Fat Quarter Shop sent me a 10 spool box of 50 weight thread from one of their exclusive sets with Aurifil. 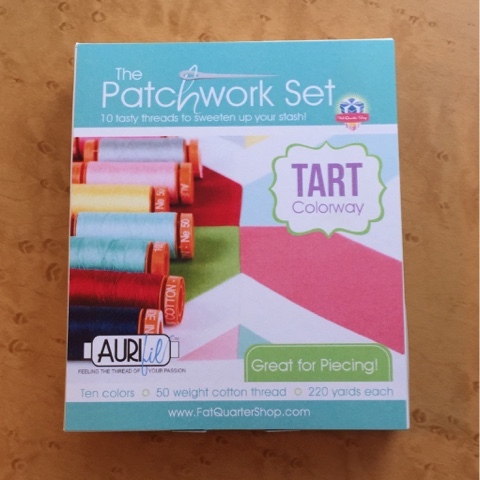 I received the Tart colorway of The Patchwork Set in the mail last week, and I was challenged to go forth and sew. So, I started off by looking at the colors of thread in the box, and I was thrilled to bits to see what I had to work with. My love of aqua punctuated with pops of pink and red make this set an amazing fit for me. I was inspired. A quick browse through my stash of patterns and fabric led me to a handful of projects that filled some very specific needs that would utilize 7 of the 10 colors of thread in the box. I can't say that I expected that with only 4 projects, but I'm not complaining. Color, color, color. Aurifil makes 270 different colors of thread (including variegated), and all of them are available in my 2 most commonly used weights - 40 and 50 weight. On top of that, they are available in both small and large spools! It's so versatile. I do all of my quilt piecing (both machine piecing and english paper piecing) with 50 weight Aurifil. I've machine quilted, hand bound quilts, and made bags with it too. It's thin enough that it won't eat up a lot of space in your seam allowance which can greatly impact the accuracy of your piecing, but it's strong enough to survive my husband, my cats, and many trips through my washing machine and dryer. I'm a blendy kind of girl. While I can appreciate that many people opt to have their stitches be a key player in their projects, I tend to go the opposite direction. I pick fabric because I want them to be the stars. By picking thread colors and weights that will virtually disappear, the fabric and pattern combination gets the attention. Does that mean that I don't ever pick a thread for some contrast? Absolutely not. I will occasionally pick thread to contrast or highlight something, but it's not the norm for me as most of my sewing projects demonstrate. Low lint. One of the negatives about using cotton thread is lint. It's a natural fiber, and lint happens. It's just part of the game. One of the reasons that I really got hooked on Aurifil a few years ago was that I was seeing far less lint build up than I was getting with Mettler (both Silk Finish and Quilting), Gutermann, and Superior threads that I had tried (I even blogged about my Aurifil love 2 years ago - Another Edition of A Few of My Favorite Things: Thread Edition). I'm also pleased to say that most of the shops that I frequent now stock a large assortment of the 50 weight thread. Thread Boxes/Sets. I love pretty packages of pretty things. Aurifil has teamed up with shops like Fat Quarter Shop and several fabric manufacturers to release collections that are specially coordinated to a theme, a designer, or a fabric collection. These sets can take a lot of guesswork out of trying to match thread with fabric especially for people like me that are fussy about matching colors. Alex Veronelli, aka Mr Aurifil. He's good looking, he knows a ton about thread, and his accent is dreamy. Yes, I totally went there. Now, it's time to share the projects! 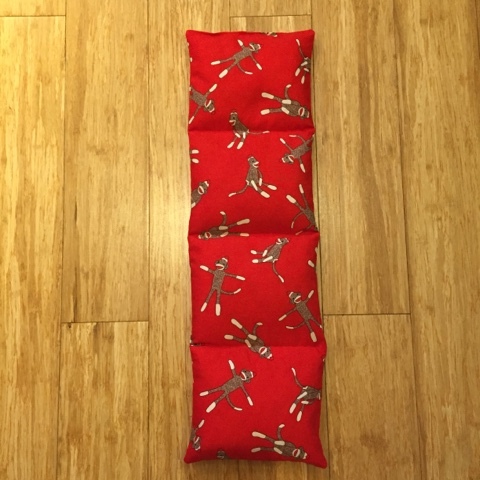 The next project on my list was to re-make my falling apart at the seams herbal neck pillow. I paired the red sock monkey fabric from Erin Michael's 5 Funky Monkeys collection for Moda with Aurifil 2250 (Red). I've used this fabric for several projects including the a robe for me, a set of flannel PJs for my mom,a robe for one of my sock monkeys (I made it from scraps from the PJ set), PJ pants, and a quilt from the flannel substrate and PJ pants, PJ shorts,and a quilt from the quilting cotton. I only had a fat quarter left, so I stitched the pieces together, turned it right side out, calculated and marked lines that would divide the pillow into sections (so the filling would stay pretty evenly distributed), and I sliced into the pillow to re-use the yummy smelling filling. I filled one section at a time and stitched a line where I had marked to close each segment. Knowing that I would heat my pillow in the microwave, using 100% cotton fabric and thread was essential. I'm not usually one to "wing it", but that's precisely what I did for this. My awesome "new" neck pillow in Erin Michael's adorable Sock Monkey fabric all ready to be used when it isn't 90+ degrees outside. 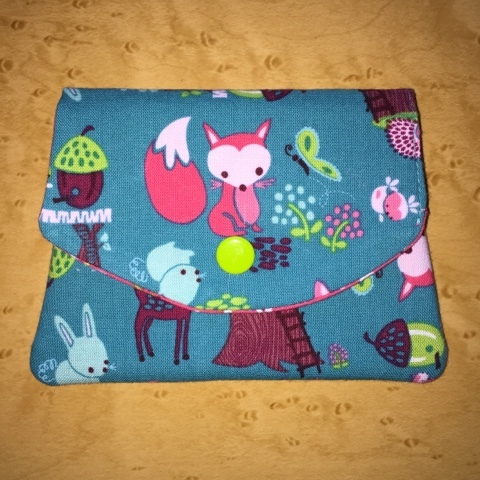 With those two projects out of the way, I wanted to make Anna Graham of Noodlehead's Open Wide Zippered Pouch from the tutorial that she has on her blog. I've seen some seriously adorable pouches made from this pattern, but I had never made one. I have been saving a fat quarter of an adorable novelty Sushi print from Timeless Treasures for the right project, and this was it. 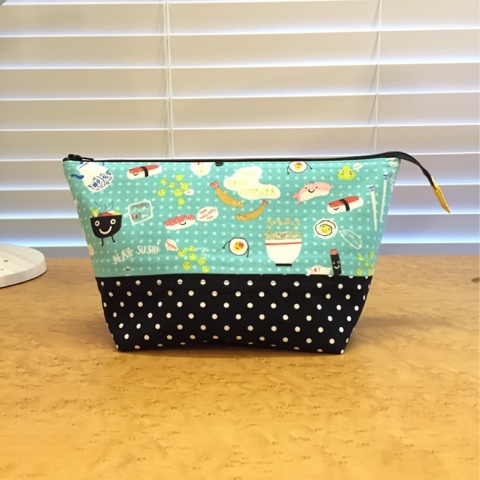 I paired it with a black and white dot for a contrasting bottom (yup, I used polka dots again) also from Timeless Treasures, and a bright yellow rain print from, you guessed it, Timeless Treasures for the interior and zipper pull tab. These matched colors 5006 (Light Turquoise) and 1135 (Pale Yellow) from my Fat Quarter Shop + Aurifil The Patchwork Set in the Tart colorway, but I added in 2692 (Black) that I had in my thread stash. With only a fat quarter of the Rain fabric on hand, I made largest size I could, medium. While I don't really enjoy eating sushi, I sure do love sushi fabric! While one is great, two are better! 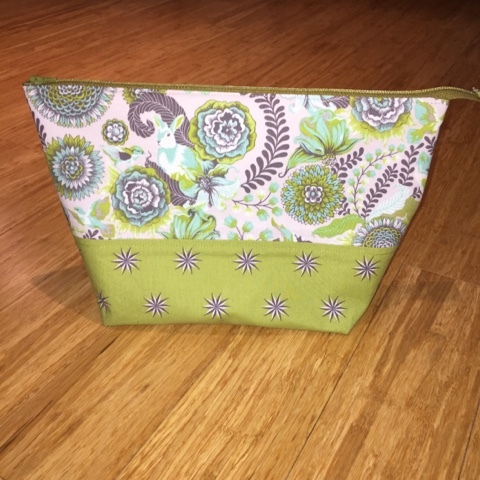 Anna provided instructions on how to make this bag in 3 different sizes, so I made one in the largest size using Tula Pink's Fox Field fabric. More specifically, I used the Foxtrot, Vintage Stars, and Scribbles (for the lining) prints. I thought the large size would be great for showing off both of the exterior prints. I used colors 2606 (Mist) and 2888 (Fern Green) from my FQS thread set. Well, that's about it from me for now. I'm so excited to have been given the opportunity to play with this amazing box of thread, and they have quite a few other sets that will certainly cater to different needs. With Aurifloss and 12wt options (in addition to the 50wt) in 4 different color themed sets, I think Fat Quarter Shop hit it out of the park.